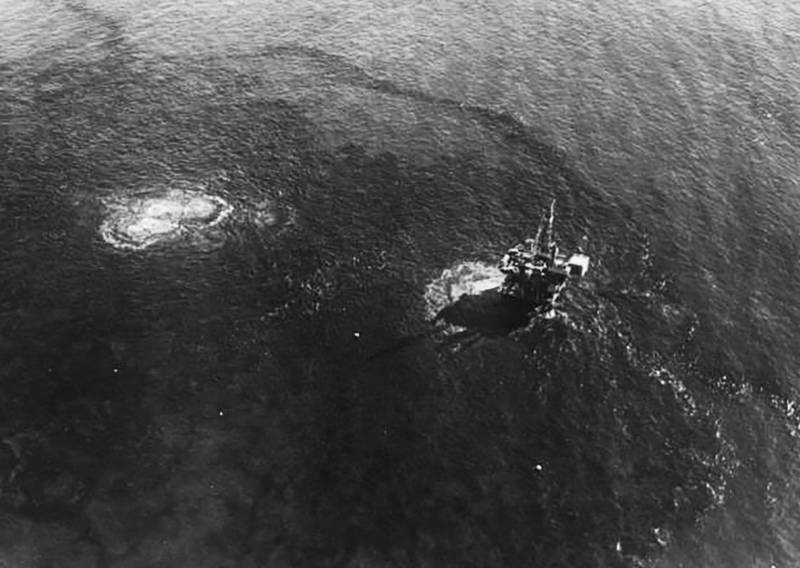 On January 28, 1969, an oil well off the coast of Santa Barbara, Calif., experienced a blowout. The result was an oil spill that at the time ranked as the largest in U.S. waters. The disaster, which made headlines across the nation, helped create the modern environmental movement. It also led to restrictions on offshore drilling — restrictions the Trump Administration is trying to loosen. The events that led to the spill began one morning on Platform A, a rig located about six miles from the coast and operated at the time by Union Oil. Workers had already drilled four wells from the platform and were drilling a fifth when they ran into a problem. 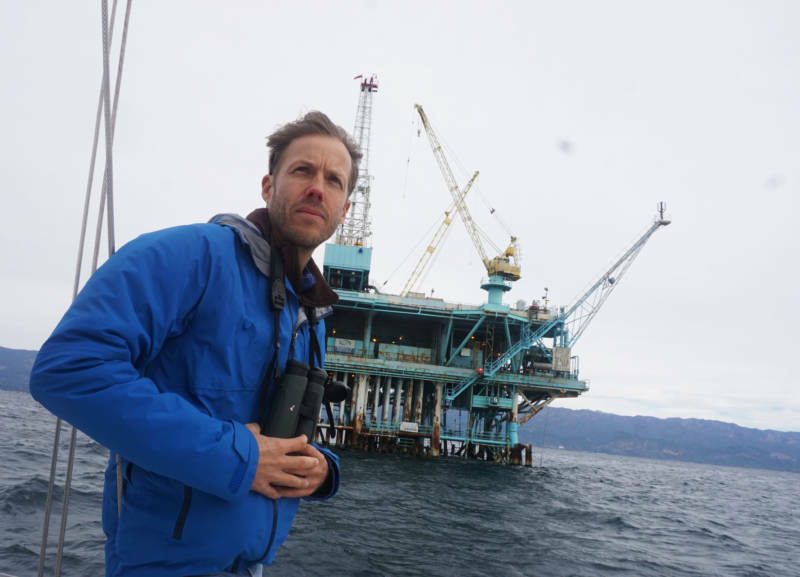 "You punch into some of these oil reservoirs and you get a lot of back pressure," says Douglas McCauley, a marine biologist at the University of California, Santa Barbara. McCauley has brought me out to Platform A on a boat, which circles the rig as he talks. He tells me that in this case, the back pressure overwhelmed the well's safety systems. This allowed crude oil and natural gas trapped thousands of feet down to rocket toward the surface. "So they're taking these big drilling pipes and shoving them back down the hole and these gigantic steel blocks on top of that to seal off this blowout," McCauley says. It worked, but only for a few minutes. "They had capped off the blowout successfully," McCauley says. "But they created so much pressure at the bottom of this well that it actually broke open the seabed." Better reinforcement of the well might have prevented the spill. But Union Oil had received a waiver from the government that allowed the company to drill without installing steel casing pipe to the depth usually required by federal regulations. Unimpeded, oil and gas under tremendous pressure opened five separate gashes in the soft sandstone seabed. So much gas bubbled to the surface near Platform A that the water appeared to boiling. And oil from the underwater fissures began to form a slick that would eventually cover an area nearly the size of Chicago. The effect on marine life was profound. "Right where we're sitting right now you transformed from this ecosystem of amazing richness, amazing biodiversity, amazing biological activity into a sort of Armageddon of blackness," McCauley says. 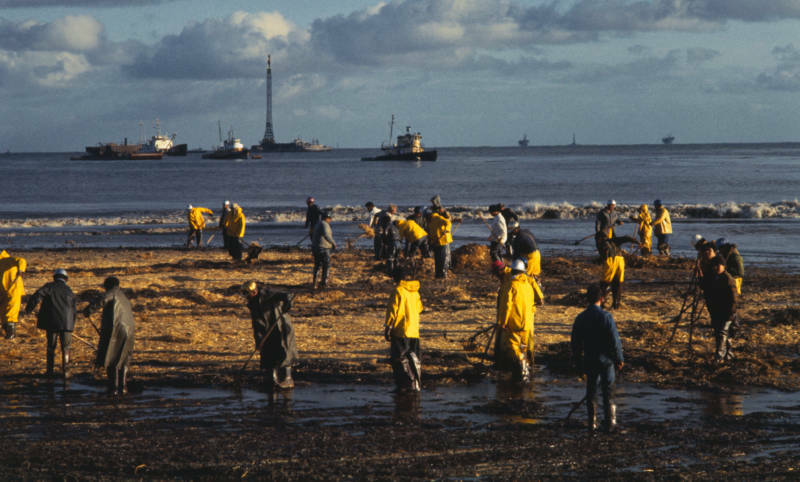 It took a few days for the oil to reach Santa Barbara's famous beaches. "I smelled it long before I saw it; it really stank around here," says Marc McGinnes, a lawyer who came down from San Francisco. "And when I looked at the oil on the beach, I cried." McGinnes left his job at a big law firm to help launch a legal response to the spill. He would go on to become a key figure in the environmental efforts that grew out the event as well as a faculty member at UCSB. Cleanup workers rake oil-soaked hay along a Santa Barbara beach in 1969, after an oil spill that was then the largest in U.S. history. The spill received enough media attention that President Richard Nixon made a trip to survey the damage in a helicopter. 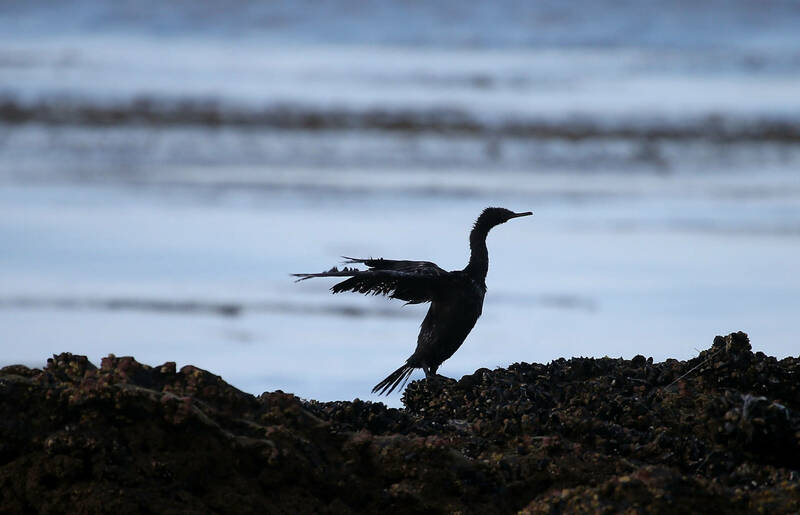 He also visited an oil-soaked beach near Santa Barbara Harbor. Nixon spent his time on the beach "walking around gingerly" to avoid stepping on the sticky blobs of oil, McGinnes says. 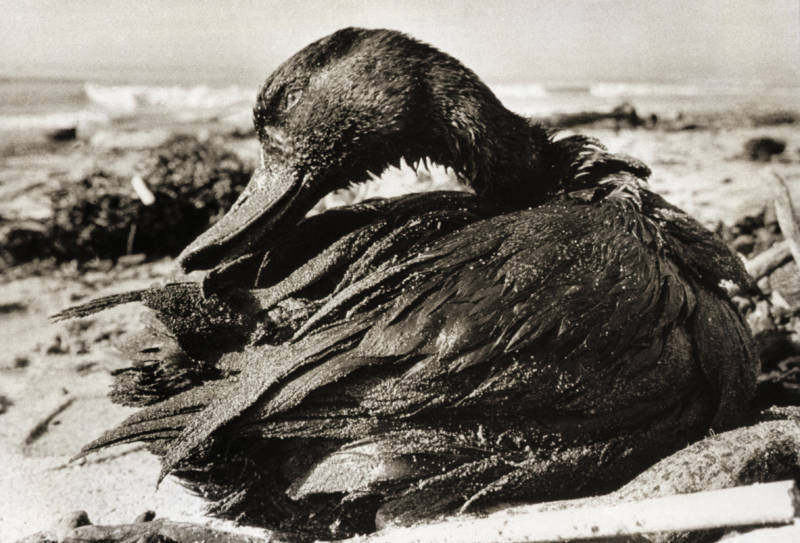 The oil killed thousands of birds and an unknown number of sea mammals. Hundreds of oiled birds that were still alive were taken to the Santa Barbara Zoo, which is just a few steps from the beach. "At the time there was really no place or process to care for the oiled wildlife that was showing up on the beaches," says Nancy McToldridge, the zoo's director. "So the zoo closed its doors and concentrated its time and energy into taking in these oiled birds, treating them and then rehabbing them back out into the wild." The suffering and deaths of so many animals helped get the public's attention and spur lawmakers to action. And 1969 marked a turning point for environmental activism. "The Santa Barbara oil spill really helped to take an issue that was growing and really convert it into legislative action and a whole body of environmental law at the federal level and also at the state level that we still have with us today," says Peter Alagona, a historian at UCSB. The first Earth Day took place just over a year later in April of 1970. The Environmental Protection Agency was created in December of that year. Environmental laws passed or strengthened during this period included the Clean Air, Clean Water and Endangered Species Acts. One reason the 1969 oil spill had such an impact was that Santa Barbara was home to a lot of wealthy Republicans who had helped elect Nixon, Alagona says. Nixon himself was no environmentalist, Alagona says, "but he realized during a time when there were many other extremely controversial, divisive issues like the Vietnam War for instance, that as American public concern grew about damage to the environment that this could potentially be a winning issue for him." So Nixon signed the environmental legislation, even though many in his own party opposed it. The oil slick visible around Platform A in the Santa Barbara Channel emanated from fissures in the seabed. Today, Santa Barbara is much better prepared for an oil spill than it was in 1969. There's a 46-foot fast-response vessel in the harbor. And animals exposed to oil are cared for by a statewide group called the Oiled Wildlife Care Network. The response system got a test in 2015, when an oil pipeline burst a few miles up the coast. Workers deployed thousands of feet of floating boom to help contain the spill and skimmer boats began removing the oil from the water's surface. Meanwhile, members of the Oiled Wildlife Care Network sprang into action, rescuing and caring for oiled animals. And those animals were more likely to survive than the ones oiled in 1969. "Many more animals survive now than they would have back in the '60s or '70s or even the '80s," says Julie Barnes, a veterinarian and vice president for animal health and care at the Santa Barbara Zoo. That's partly because of what animal care experts learned from the Santa Barbara spill, Barnes says. But they've learned even more from the Exxon Valdez spill in Alaska in 1989 and the 2010 Deepwater Horizon spill in the Gulf of Mexico. "It's got to the point that there's so many spills that for animals there's a highly organized system in place," Barnes says. These days, the greatest environmental danger from oil probably isn't another spill, McCauley says. It's the climate change caused by burning all that oil. Santa Barbara got a preview of what that might mean a year ago, he says. It came in the form of a mudslide that careened through the community of Montecito. "There were boulders and trees traveling at like 22 miles per hour down the street," McCauley says. "It destroyed 100 houses and killed 21 people. It's difficult to peg any one incident to climate change. But the mudslide followed the sort of extreme weather thought to accompany global warming. "I think of that as being the most insidious, the worst thing the oil industry has done to our community," McCauley says. An end to offshore drilling would help reduce the effects of climate change by reducing the supply of oil, he says. But the Trump Administration seems headed in the other direction. The Bureau of Ocean Energy Management is preparing a five-year plan expected to greatly increase offshore drilling in federally controlled waters, including those off the coast of Santa Barbara.